65 days,F1 hybrid. 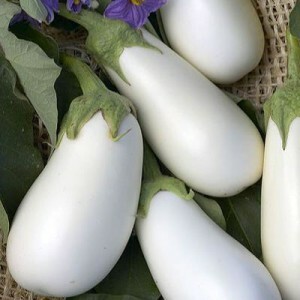 Long pure white teardrop shaped, bitter-free eggplants, 7 in/17 cm in length, 2.75 in/7 cm wide with a green calyx. Plants are resistant to Tobacco Mosaic Virus. Good foliage cover. Excellent variety.